Sore throat is quite annoying. And god forbid, if it is accompanied by pain or inflammation, all your plans go out of the window. Apple cider vinegar (ACV) has been used since ages for various household purposes, and most importantly, in cooking. Be it salads, dressings, or even baking, apple cider vinegar adds a distinct flavor to everything. Of late, there has been an increase its use as a home remedy to treat various infections, including sore throat and cold. 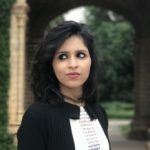 So why and how does it help cure a sore throat? Read on to know more. Apple cider vinegar is nothing but fermented apple juice. The addition of yeast to apple juice converts the fruit sugar into alcohol, which is then converted into acetic acid by bacteria. This is when we get the vinegar from apple juice. 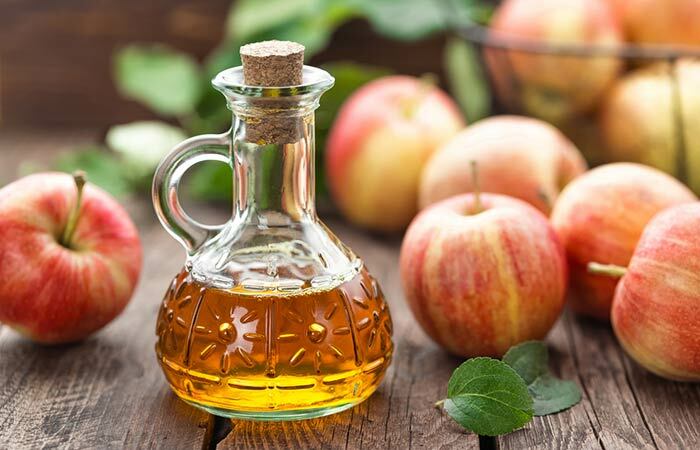 It is this acetic acid content that makes ACV an effective remedy for treating various medical conditions, including sore throat. The acidic nature of apple cider vinegar can balance the pH of the tissues of your body. This inhibits the growth and spread of bacteria in your throat. It has antibacterial properties that are quite effective in fighting against infectious germs and bacteria. ACV contains a prebiotic called inulin that boosts your immunity by increasing the number of white blood cells and T cells in your body. Apple cider vinegar has been long used as an expectorant that can loosen and thin the phlegm in your body and ease breathing (1). 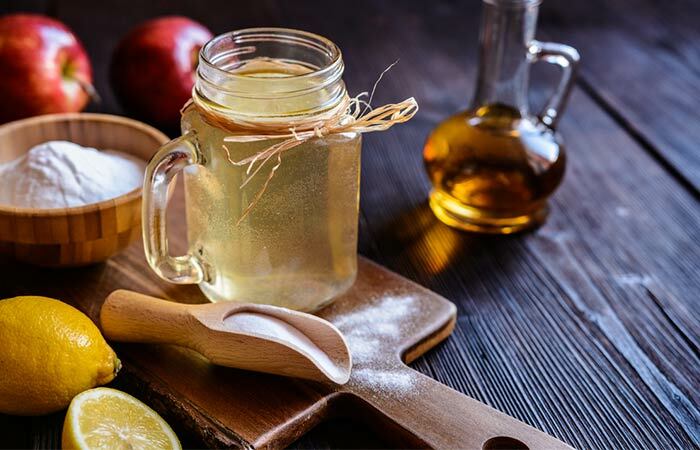 The acidic and antibacterial properties of apple cider vinegar, along with its expectorant properties, can be of great help in eliminating sore throat and the infection causing it (2). 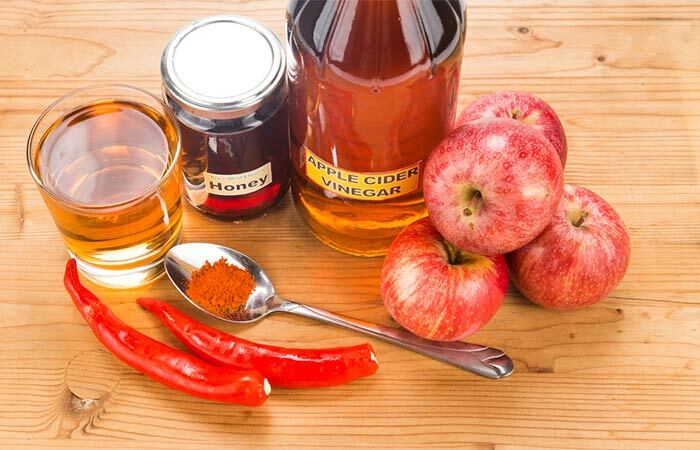 While apple cider vinegar breaks down the phlegm and decongests your nasal passage with its expectorant properties, the capsaicin in cayenne pepper offers relief from the pain and inflammation that accompany a sore throat (3), (4). 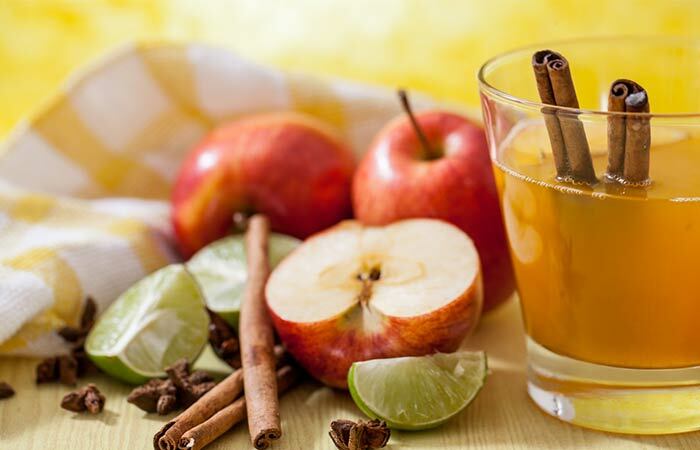 The antimicrobial and anti-inflammatory properties of cinnamon and apple cider vinegar can help you combat a sore throat and its symptoms naturally. Additionally, the healing properties of honey and lemon juice help speed up your recovery (5), (6). 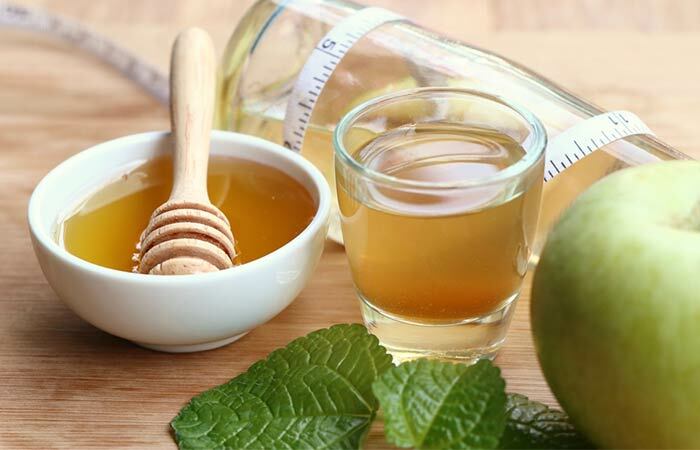 The expectorant properties of both apple cider vinegar and honey, in combination with the antibacterial and anti-inflammatory nature of honey, can provide immediate relief from a sore throat (7), (8), (9). 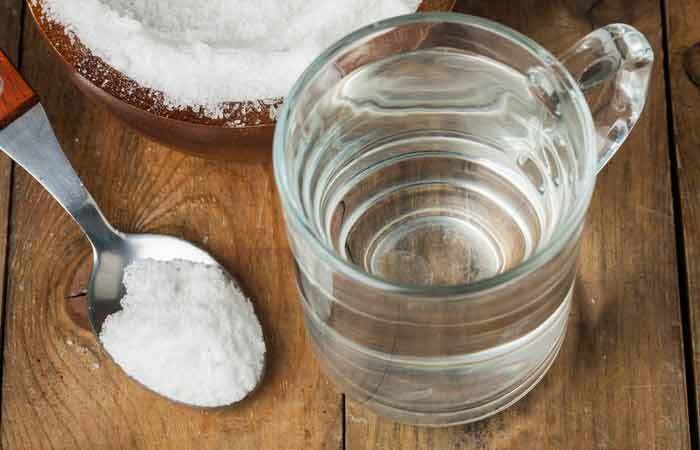 The antimicrobial properties of ACV and baking soda help kill the bacteria causing the sore throat (10). The anti-inflammatory and antibacterial properties of lemon juice can aid ACV in treating a sore throat (11), (12), (13). The antimicrobial nature of salt (sodium chloride) aids ACV in eliminating sore throat (14). These remedies can help treat a sore throat when taken in the prescribed amounts. However, given the acidic nature of ACV, it is better to take some basic precautions while using it. As ACV is highly acidic, it should be used in the diluted form. Do not take more than the recommended dose of apple cider vinegar as it may have harmful side effects. In case you experience any side effects from overdosage, see your doctor immediately. Pregnant and breastfeeding women should steer clear of apple cider vinegar. Apple cider vinegar, when consumed in moderation, has the potential to do wonders for sore throat and its irritating symptoms. 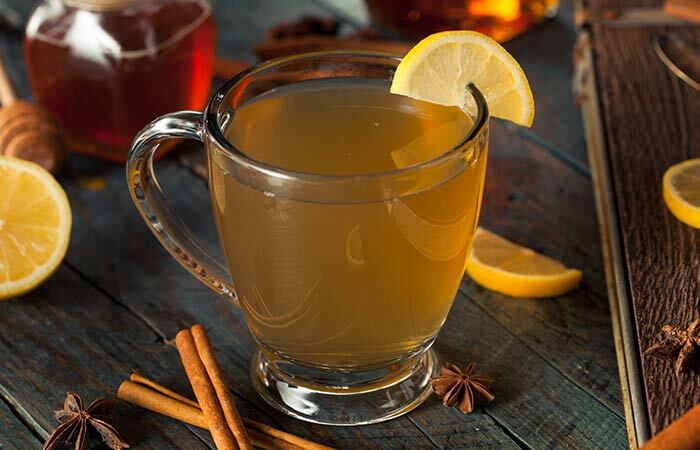 Have you ever considered apple cider vinegar for sore throat relief? If yes, how did help you? Share your experience with us by leaving a comment below.